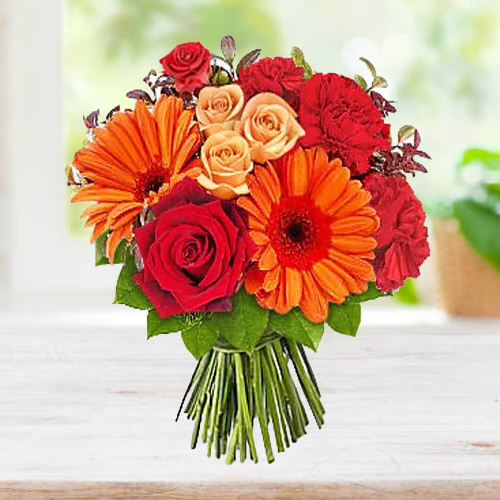 Bring the people you love closer to your heart by gifting this Beautiful Bouquet of Seasonal Flowers loaded with your affection and fondness for them. This magnificent Blossom Bunch is decked with 5 Roses, 3 Carnations, 2 Gerberas and Green Fillers tied with a Satin Ribbon. Flowers Delivery Cuddapah, Send sweets Bilaspur, Wedding Cake Kodad, Diwali Mithai Hubli, Send Flowers and Gifts to Jammu, Online Shop Udipi, Flower to Raichur, New Year Flowers Panchkula , Fresh Fruits Bhopal, Send Gift Howrah, Dry Fruits to Noida, Birthday Delivery Bhagalpur, Sending to Puri, Flower shop Raichur, Pune Online Cake Delivery.